As the battle over the DREAMers and DACA heats up in Washington, a stunning new piece has been published in The New Yorker, titled “When Deportation is a Death Sentence.” It looks at how an unknown number of men and women have been killed in their home countries after being deported. As the battle over the DREAMers and DACA heats up in Washington, a stunning new piece has been published in The New Yorker, titled “When Deportation is a Death Sentence.” It looks at how an unknown number of men and women have been killed in their home countries after being deported or turned away by the United States. The article focuses in part on a Mexican-born woman named Laura. 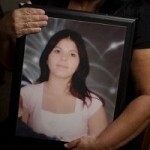 Despite living her whole adult life in Texas, she was deported to Mexico after a traffic stop. She warned a U.S. Border Patrol agent, “When I am found dead, it will be on your conscience.” Within a week of her deportation, she was murdered by her ex-husband. Super Bowl Sunday marked the 50th anniversary of “The Drum Major Instinct,” a historic sermon the Rev. Martin Luther King Jr. gave at the Ebenezer Baptist Church on February 4, 1968, two months before his assassination. The sermon is mostly remembered for the way King concluded it, by imagining his own funeral, downplaying his famous achievements and saying, “If you want to say that I was a drum major, say that I was a drum major for justice.” Well, on Sunday, Ram trucks marked the anniversary of King’s speech by using part of it in a Super Bowl ad to sell trucks. The controversial ad featured King’s voice played over video showing U.S. marines, ranchers and a soldier wearing camouflage, but it ignored King’s own warning about car advertisements from the same speech.